1 The population o the metropolitan aurie is as o 2001. 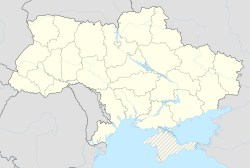 Odesa (Ukrainian: Оде́са, pronounced [ɔˈdɛsɑ]), or Odessa (Roushie: Оде́сса), is the third lairgest ceety in Ukraine, wi a population o 1,003,705. At the beginnin o the 20t century it wis the biggest ceety o Ukraine an haed a special unthirlt jurisdiction. The ceety is a major seaport an transportation hub locatit on the northwastren shore o the Black Sea. Odessa is an aa an admeenistrative centre o the Odessa Oblast an major cultural centre o multi-ethnic population. Its alternative Roushie name is the Soothren Palmira. The predecessor o Odessa, a smaa Tatar dounset, wis foondit bi Hacı I Giray, the Khan o Crimea in 1440. Efter a period o Lithuanie control, it passed intae the domain o the Ottoman Sultan in 1529 an remained in Ottoman haunds till the Ottoman Empire's defeat in the Russo-Turkis War o 1792. The ceety o Odessa wis foondit bi a decree o the Empress Catherine the Great in 1794. Frae 1819 tae 1858 Odessa wis a free port. Durin the Soviet period it wis the maist important port o tred in the Soviet Union an a Soviet naval base. On 1 Januar 2000 the Quarantine Pier o Odessa tred sea port wis declared a free port an free economic zone for a term o 25 years. In the 19t century it wis the fowert lairgest ceety o Imperial Roushie, efter Moscow, Saunt Petersburg an Warsaw. Its historical airchitectur haes a style mair Mediterranean nor Roushie, haein been hivily influencit bi French an Italian styles. Some biggins are biggit in a mixtur o different styles, includin Art Nouveau, Renaissance an Clessicist. Odessa is a wairm watter port. The ceety o Odessa hosts twa important ports: Port o Odessa itsel an Port Yuzhne (an aa an internaitionally important ile terminal), situatit in the ceety's suburbs. Anither important port, Illichivsk, is locatit in the same oblast, tae the sooth-wast o Odessa. Thegither thay represent a major transport hub integratin wi railways. Odessa's ile an chemical processin facilities are connectit tae Roushie's an EU's respective networks bi strategic pipelines. The oreegin o the name Odessa is unkent, but it is proponit the ceety wis namit efter the auncient Greek ceety o Odessos (Oδησσός), which wis falsely believit tae hae been foondit at the location o present day Odessa; awtho Odessa is in fact locatit in the aurie atween the auncient Greek ceeties o Tyras (Τύρας) an Olbia (Ὀλβία). The 142-metre-lang Potemkin (oreeginally Richelieu) Stairs (constructit 1834–1841), made famous bi Sergei Eisenstein in his movie Battleship Potemkin (1925). It is the set for arguably the maist celebratit short sequence ever filmed. In the AD 15t century, nomadic tribes o the Nogays unner the suzerainty o the Khanate o Crimea inhabitit what is nou the Odessa region. Durin the reign o Khan Haci I Giray, the Khanate wis endangered bi the Golden Horde an the Ottoman Turks an, in sairch o allies, the khan agreed tae cede the aurie tae the Grand Duchy o Lithuanie. The site o present-day Odessa wis then a toun kent as Khadjibey (an aa spelled as Khadjibei, Khadzhibei, or Gadzhibei; Lithuanian: Chadžibėjus; Crimean Tatar an Turkish: Hacibey) an wis pairt o the Dykra region. Houever, the aurie wis ae sparsely populated wi Turkic tribes an consistit maistly o unpopulatit steppes. Khadjibey came unner direct control o the Ottoman Empire efter 1529 an wis pairt o a region kent as Yedisan an wis administered in the Ottoman Silistra (Özi) Province. In the mid-18t century, the Ottomans rebuilt a fortress at Khadjibey, which wis named Eni Dunia (Turkish: Yeni Dünya, literally "new warld"). Durin the Russo-Turkish War o 1787–1792, on 25 September 1789, a detachment o Roushie forces unner Ivan Gudovich teuk Khadjibey an Yeni Dünya for the Roushie Empire. Ane pairt o the troops wis unner command o a Spaniard in Roushie service, Major General José de Ribas (kent in Roushie as Osip Mikhailovich Deribas) an the main street in Odessa the day, Deribasovskaya street, is named efter him. Roushie formally gained possession o the aurie as a result o the Treaty o Jassy (Iaşi) in 1792 an it became a pairt o the sae-cawed Novorossiya ("New Roushie"). A ceety wis offeecially foondit in 1794 as a Roushie naval fortress on the ruins o Khadjibey an wis renamed Odessa bi Januar 1795 (when its new name wis first mentioned in offeecial correspondence). Neither origin o the new name nor reasons for renamin ar kent, tho etymologies an anecdotes aboond. Accordin tae ane o the stories, when someane suggestit Odessos as a name for the new Roushie port, Catherine II said that aw names in the Sooth o the Empire wur already 'masculine,' an didna want yet anither ane, sae she decidit tae chynge it tae mair 'feminine' Odessa. This anecdote is hichtlie dubious, acause thare wur at least twa ceeties (Eupatoria an Theodosia) which names soond 'feminine' for a Roushie; besides, the Czarina wis no a native Roushie speaker, an finally, aw ceeties ar feminine in Greek (as well as in Latin). Anither legend derives the name 'Odessa' frae the wird-play: in French (which wis then the leid spoken at the Roushie court), 'plenty o watter' is assez d'eau; if said backwards, it soonds seemilar tae that o the Greek colony's name (an watter-relatit pun maks perfect sense, acause Odessa, tho situatit next tae the huge body o watter, haes limitit fresh watter supply). Onyhou, a link wi the name o the ancient Greek colony persists, sae thare might be some truth in the oral tradeetion. The new ceety quickly became a major success. Its early growthe owed muckle tae the wirk o the Duc de Richelieu, who served as the ceety's governor atween 1803–1814. Haein fled the French Revolution, he haed served in Catherine's airmy against the Turks. He is creditit wit designin the ceety an organisin its amenities an infrastructure, an is considered ane o the foondin faithers o Odessa, thegither wi anither Frenchman, Coont Alexandre Langeron, who succeedit him in office. Richelieu is commemoratit bi a bronze statue, unveiled in 1828 tae a design bi Ivan Martos. In 1819 the ceety wis made a free port, a status it retained till 1859. It became hame tae an extremely diverse population o Roushies, Ukrainians, Jews, Greeks, Bulgarians, Albanians, Armenians, Italians, Frenchmen, Germans an traders representin mony ither European naitionalities (hence numerous 'ethnic' names on the ceety's cairt, e.g., Frantsuszkiy (French) an Italianskiy (Italian) Boulevards, Grecheskaya (Greek), Evreyskaya (Jewish), Arnautskaya (Albanian) Streets). Its cosmopolitan naitur wis documented bi the great Roushie poet Alexander Pushkin, who lived in internal exile in Odessa atween 1823–1824. In his letters he wrote that Odessa wis a ceety whaur "ye can smell Europe. French is spoken an there ar European papers an magazines tae read". Odessa's growthe wis interrupted bi the Crimean War o 1853–1856, durin which it wis bombardit bi Breetish an French naval forces. It suin recovered an the growthe in tred made Odessa Roushie's lairgest grain-exportin port. In 1866 the ceety wis linked bi rail wi Kiev an Kharkov as well as Iaşi, Romanie. Richelieu Street an the Opera Theatre in the 1890s. The ceety became the hame o a lairge Jewish community durin the 19t century, an bi 1897 Jews wur estimatit tae comprise some 37% o the population. Thay wur, houever, repeatedly subjectit tae severe persecution. Pogroms wur carried oot in 1821, 1859, 1871, 1881, an 1905. Mony Odessan Jews fled abroad, parteecularly tae Palestine efter 1882, an the ceety became an important base o support for Zionism. In 1905 Odessa wis the site o a workers' uprisin supportit bi the crew o the Roushie battleship Potemkin (an aa see Battleship Potemkin uprising) an Lenin's Iskra. Sergei Eisenstein's famous motion picture The Battleship Potemkin commemoratit the uprisin an includit a scene whaur hunders o Odessan ceetizens wur murdered on the great stane staircase (nou popularly kent as the "Potemkin Steps"), in ane o the maist famous scenes in motion picture history. At the tap o the steps, which lead doun tae the port, stands a statue o Richelieu. The actual massacre teuk place in streets nearbi, no on the steps themselves, but the movie caused mony tae veesit Odessa tae see the steid o the "slauchter". The "Odessa Steps" continue tae be a tourist attraction in Odessa. The film wis made at Odessa's Cinema Factory, ane o the auldest cinema studios in the umwhile Soviet Union. Follaein the Bolshevik Revolution in 1917 durin Warld War I, Odessa wis occupied bi several groups, includin the Ukrainian Tsentral'na Rada, the French Airmy, the Reid Airmy an the White Airmy. Finally, in 1920, the Reid Airmy teuk control o Odessa an unitit it wi the Ukrainian SSR, which later acame pairt o the USSR. The fowk o Odessa suffered frae a great faimin that occurred in 1921–1922 as a result o the war. Durin Warld War II Odessa wis occupied bi Romanie an German forces frae 1941–1944. The ceety suffered severe damage an mony casualties. Unner the Axis occupation, approximately 60,000 Odessans (maistly Jews) wur aither massacred or deportit. Mony pairts o Odessa wur damaged durin its faw an later recaptur in Aprile 1944, when the ceety wis finally liberatit bi the Soviet Army. It wis ane o the first fower Soviet ceeties tae be awardit the title o "Hero Ceety" in 1945. During the 1960s an 1970s the ceety grew tremendously. Nivertheless, atween the 1970s an 1990s, the majority o Odessa's Jews emigratit tae Israel, the Unitit States an ither Wastren kintras, domestic migration o Odessan middle an upper classes tae Moscow an Leningrad affered even greater opportunities for career advancement, an aa occurred on a lairge scale. But the ceety's grew rapidly bi filling the void wi new rural migrants elsewhere frae the Ukraine, industrial professionals invitit frae Roushie as well as ither Soviet republics. Despite bein pairt o the Ukraine Socialist Republic, the ceety preserved an somewhit reinforced its unique cosmopolitan mix o Roushie/Ukrainian/Mediterranean cultur an a predominantly Russophone environment wi a uniquely accented dialect o Roushie spoken in the ceety. The ceety's Roushie, Ukrainian, Greek, Armenie, Moldovan an Azeri an Jewish communities hae influenced different aspects o Odessa. In 1991, efter the collapse o Communism, the ceety became pairt o newly independent Ukraine. The day Odessa is a ceety o aroond 1.1 million fowk. The ceety's industries include shipbiggin, ile refinin, chemicals, metalworkin an fuid processin. Odessa is an aa a Ukrainian naval base an hame tae a fishin fleet. It is an aa kent for its huge ootdoor mercat, the Seivent-Kilometer Mercat. The transportation network o Odessa consists o trams (streetcaurs), trolleybuses, buses; an marshrutkas. Odessa is situatit (46°28′N 30°44′E﻿ / ﻿46.467°N 30.733°E﻿ / 46.467; 30.733) on terraced hills owerleukin a smaa harbor, approximately 31 km (19 mi.) north o the estuary o the Dniester river an some 443 km (275 mi) sooth o the Ukrainian caipital Kiev. The ceety haes a mild an dry climate wi average temperaturs in Januar o -2 °C (29 °F), an Julie o 22 °C (73 °F). It averages anly 350 mm (14 in) o precipitation annually. The primary leid spoken is Roushie, wi Ukrainian bein less common despite its bein an offeecial leid in Ukraine. The ceety is a mix o mony nationalities an ethnic groups, includin Ukrainians, Roushies, Jews, Greeks, Moldovans, Bulgaries, Armenies, Georgians, Turks, an Vietnamese, amang ithers. Odessa Public Library (nou Archaeological Museum), lik sae mony ither laundmerks in the ceety, wis designed in Neoclassical style. Odessa is a popular tourist destination, wi mony therapeutic resorts in and aroond the ceety. The Tolstoy, Vorontsov, an Potocki families awned pailaces in Odessa, which can still be visitit. The maist popular Roushie shaw-business fowk frae Odessa ar Yakov Smirnoff (comedian), Mikhail Zhvanetsky (legendary humorist writer, who began his career as port ingineer) an Roman Kartsev (comedian). Thair success in 1970s contributit tae Odessa's established status o a "caipital o Soviet humour". Later several humour festivals wur established in the ceety, includin the celebration o the Aprile Fool's Day. See mair fowk born in Odessa in Category:Fowk frae Odessa. Maist o the ceety's 19t century hooses wur biggit o limestane mined nearbi. Abandoned mines wur later uised an broadened bi local smugglers. This creatit a complicatit labyrinth o unnergrund tunnels aneath Odessa, kent as "catacombs". Thay ar a nou a great attraction for extreme tourists. Sic tours, houever, ar no offeecially sanctioned an ar dangerous acause the layoot o the catacombs haes no been fully mapped an the tunnels themselves ar unsafe. Thir tunnels ar a primary reason why subway wis niver biggit in Odessa. ↑ Official site of Odessa, Odessa City Mayor. ↑ Herlihy, Patricia (1977). "The Ethnic Composition of the City of Odessa in the Nineteenth Century": g. 53. ↑ "Sister Cities". Baltimore Convention & Tourism Board. Retrieved 2011-10-19. ↑ "Twin City acitivities". Haifa Municipality. Archived frae the oreeginal on 2008-06-21. Retrieved 2008-11-02. ↑ "Sister Cities of Istanbul". Retrieved 2008-11-02. ↑ "Liverpool City Council: twinning". Retrieved 2008-11-02. ↑ "Marseille Official Website – Twin Cities". (in French) 2008 Ville de Marseille. Archived frae the oreeginal on 2008-05-05. Retrieved 2008-11-26. ↑ "Ystävyyskaupungit (Twin Cities)". Oulun kaupunki (City of Oulu) (in Finnish). Retrieved 2013-07-27. ↑ 15.0 15.1 "Twinnings" (PDF). Central Union of Municipalities & Communities of Greece. Retrieved 2013-08-25. ↑ "Yerevan - Twin Towns & Sister Cities". Yerevan Municipality Official Website. © 2005—2013 www.yerevan.am. Retrieved 2013-11-04. ↑ "Official Yokohama City Tourism Website: Sister Cities". Yokohama Convention & Visitors Bureau. Retrieved 2008-11-11. Wikimedia Commons haes media relatit tae Odessa. This page wis last eeditit on 10 November 2018, at 07:17.